It isn’t uncommon on the internet to find claims that christianity is just a copy of some pagan religion, and Jesus is no more historical than some mythical pagan god. I want to look at what the experts say about these claims – today, Mithras. Mithraism was a mystery religion practiced in the Roman empire, probably only by men, especially by soldiers, in the first to fourth centuries. Followers went through a series of secret initiations and rituals (that’s why it is called a ‘mystery religion’), and met in underground temples (called a mithraeum), many of which have been found by archaeologists. 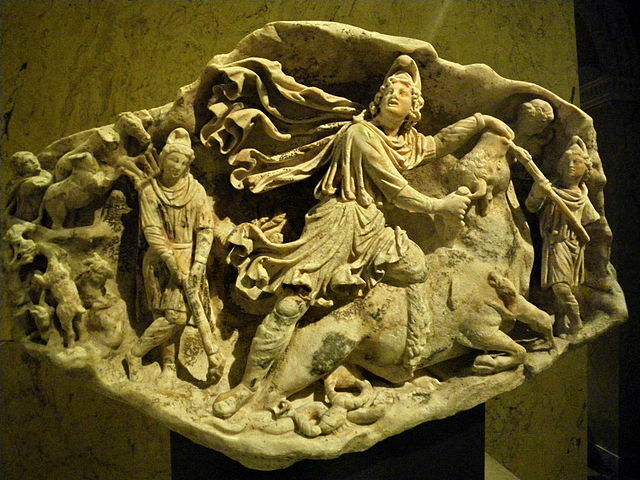 Mithras should not be confused with Mithra, a Zoroastrian god worhiped in Persia/Iran centuries earlier. Many sceptics link the two, but although scholars believe the name has been copied, they have concluded that the two gods/religions have very little else in common. A century ago, some of these views were held, mostly because there was limited evidence to refute them. But beginning almost 50 years ago, scholars have concluded that most of the claims cannot stand. The sceptics’ claims are based on outdated information. The claims often confuse Mithra and Mithras, when scholars believe the two beliefs were quite separate and distinct. No-one knows much about Mithraism, because no texts have been found. However this makes it easier for sceptics to make claims. The timing is wrong. Mithraism didn’t appear until the mid to late first century, after christianity was established. If there was any copying, it would have to have been the other way, but scholars say the two are almost totally independent. The claimed parallels are mostly imagined. There is no record confirming any of the above claims. Mithras didn’t sacrifice himself, no-one knows how or even if he died, we know of no resurrection, he wasn’t born of a virgin (but from a rock), and since we have no written teachings, the christian sounding names are imagined also. The scholars are almost totally agreed. Christianity did not borrow from Mithraism. The claimed parallels are mostly invented, and Mithraism came on the scene too late. The “evidence” for the claims is mostly based on outdated authors whose views have long since been overturned by historians. But the claims get repeated on the internet, and they seem to have authority (until they are examined). The late Prof Gary Lease of the University of California: “After almost 100 years of unremitting labor, the conclusion appears inescapable that neither Mithraism nor Christianity proved to be an obvious and direct influence upon the other”. For a more detailed analysis of the claims plus quotes and references from expert historians, see Jesus and Mithras. Photo: Tauroctony (killing of the bull, a central part of Mithraism) in Kunsthistorisches Museum, in Wikipedia.